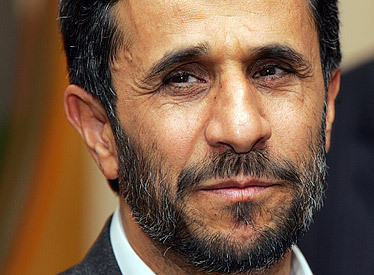 Ahmadinejad Says Comments About Gays Were Misunderstood. Are there gays in Iran? President Mahmoud Ahmadinejad, asked about the issue of homosexuality in his country during his controversial appearance at Columbia University two weeks ago, said there aren’t any. Or maybe he said there are. It’s hard to tell. The Iranian leader, through a spokesman, sought Wednesday to clarify his remarks, which generated both anger and laughter during his visit to New York. On Wednesday, Ahmadinejad’s media adviser, Mohammad Kalhor, told Reuters what the president really meant to say was that the United States had a larger gay population than Iran does. He said Ahmadinejad was simply misunderstood by Western media. So, as they say in New York … Let’s go to the videotape. FOXNews.com has reviewed a video copy of his speech through a Farsi interpreter. Kalhor told Reuters that Ahmadinejad did not intend to imply that there are no homosexuals in Iran. Rather, he said, the president wanted to say that homosexuality is not as common as it is in the West because of cultural and religious differences. Human rights groups have posted pictures of homosexuals purportedly being hanged in Iran. This is a really good article. I enjoyed reading it. I gained a lot of information reading your post. I really loved it. I never ever post, but this time I will…thanks alot for the great blog. Previous Previous post: Ever Dreamed of Being a Rockstar?